Tag Archives for " free agent nation "
4	Is small business ownership a career? 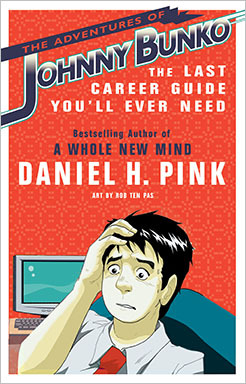 Dan Pink is the author of two very important books on ideas around careers – Free Agent Nation and A Whole New Mind. If you own a small business, that’s your current career – but I wonder how many small business owners actually view it that way? In Free Agent Nation he defined what a lot people were starting to feel, that it was becoming cool to do your own thing, start a business or just jump from project to project. In A Whole New Mind he revealed a great deal about the nature of the Free Agent Work and how it had changed from information work to strategic, right-brain work. I caught up with him for a recent episode of the Duct Tape Marketing podcast to discuss his latest take on work called The Adventures of Johnny Bunko – The last career guide you will ever need. One of the most intriguing elements of the book is that it’s written in the Japanese comic style known as manga – a book style known in the US primarily by teens, but widely used to communicate every possible topic to kids and adults in Japan. One of my favorite lessons (there are six in all) is – There is no plan. Now, Pink has written this book in the point of view of career guide, but every word of it applies to the small business, even if it hadn’t dawned on you that your business is a career. With that in mind, I share Pink’s notion about “the big plan” – I believe that small business owners need to have an intention, a vision – the big idea, but sometimes you’ve got to let go of just exactly how you get there. Sticking to the plan is what often stifles opportunity. I’m not suggesting that you use this bit of advice as an excuse to tilt at windmills, I’m just saying, create the vision and let go of some of details. Don’t confuse what I said above as a dis of planning, I’m also a big fan of planning – not because of the end results, a neatly bound document, because of the process and what it means to creating, keeping and growing the vision. Actively participate in planning, stoke the vision, but understand that sometimes just getting up tomorrow with an open mind and paying attention to what’s happening in this moment is the plan.